If you're looking for a point and shoot capable of a little extra then the SX170 will probably tick all of your boxes and more. Easy to use, good value for money and rugged enough to survive life's knocks and bumps. 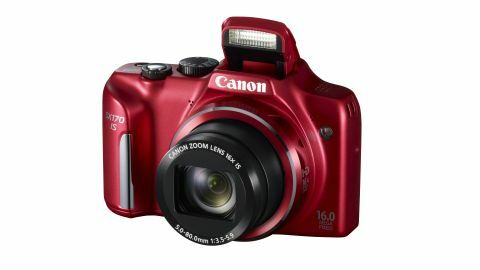 Released only a year after the SX160, the Canon PowerShot SX170 shares many of the same features but comes with a new battery and an updated design. Billed as a mid-range super zoom compact, the SX170 is aimed at regular camera users as well as novices, with the option of shooting in full manual mode available to those who like to have more control over their shots. With a 16MP CCD sensor, a 16x super zoom wide angle lens (28–448mm equivalent), a 3 inch LCD screen and full manual mode available, the SX170 IS is a nice addition to the mid-range point and shoot lineup. Users should be happy to hear that the SX170 is the first PowerShot in this range to come with a rechargeable lithium ion battery, which according to the user manual means you should be able to get twice as many shots with it before needing to recharge, offering 300 shots per charge versus the SX160's 140. It also has an eco mode, meaning you can potentially get 440 shots per charge. Canon has packed a powerful zoom into this camera, offering 16x optical super zoom and 32x ZoomPlus (digital zoom), with the addition of its trademark image stabilisation technology to help you take super-sharp tele shots. Available in black and red, the housing has also had a bit of an update and the autofocus has had a couple of tweaks too. It does have a couple of limitations - Canon has declined to add a touchscreen to this model, you can't shoot in raw format and it doesn't have any inbuilt Wi-Fi capabilities. You can also only shoot video in HD 720p, as opposed to the higher resolution 1080p. These are small niggles however, and the the SX170 still offers good value for money. There are ten shooting modes available, including Live View Control mode - which allows users to customise image brightness or colours when shooting, aperture priority, shutter priority and discreet mode. There is also a mode with six creative filters included on the camera, allowing users to use settings like monochrome and Super Vivid to change the look of their photos. Available for £150 / $180, the Canon Powershot SX170 IS is competing with other mid-range point and shoots like the Panasonic DMC-TZ30 and the Nikon Coolpix L620. The first thing you notice with the SX170 is the nice chunky handgrip - it's easy to hold and isn't likely to slip out of your fingers. It's also noticeable that the pop-up flash is well away from stray fingers, always useful for people who don't have the daintiest of hands. Most of the buttons are situated on the back of the unit, to the right of the three-inch LCD screen - with the mode dial, zoom, shutter and power buttons on the top. On the back of the SX170 you'll find a scroll wheel which also doubles as a four-way control pad, allowing users faster access when flipping between controls or when viewing their images in playback mode. For anyone familiar with the Canon menu system the SX170 will be easy and intuitive to use; for anyone who's not, it shouldn't take them long to get up to speed. The majority of the shooting options are accessible via the control pad, while the dedicated menu button takes care of settings like date and time and autofocus options. The SX170 also has a dedicated button for exposure compensation - which doubles as the 'change function' button while shooting in full manual. While not exactly jean pocket friendly - unsurprising given the range of the zoom lens - the SX170 will still fit more than comfortably in a bag or coat pocket and is light enough to carry in your hand without it feeling awkward or heavy - even with the battery it still only weighs in at 251 grams. There's no doubt that the SX170 is an easy camera to use. All the buttons are well placed, the on screen menu tips are helpful and settings are clearly labelled - allowing users to spend minimal time fiddling with settings and maximum time shooting. We only had two issues with the SX170 - when shooting using optical zoom it was sometimes slow to focus, and hunted for focus in low light situations for a frustrating amount of time before locking on. In general the optical zoom performance was superb, and although the digital zoom produced fairly noisy images when shooting at the far end of the lens, that's not completely unexpected, given that the images are a crop of a full resolution image. Our second issue was the occasional lack of clarity on the LCD when shooting - possibly a result of the SX170 using the slightly outdated 230,000-pixel technology on the screen, Oddly, when reviewing images during playback there were no issues and the photos are crisp and sharp. Overall the SX170 feels like a quality piece of kit - nothing about it feels flimsy or cheap. Weather and dust proof, it should be able to deal with most of the things that regular users throw at it.